Sara has been encouraging other local libraries to host presentations of Bob’s current series, Maritime Washington: A Watercolor History. Several libraries already have and more are signing up. Living in the Northwest, you have undoubtedly seen the art of Robert Chamberlain, you just may not know it. 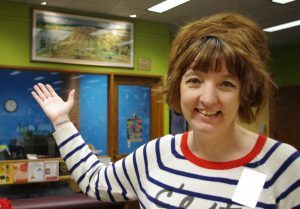 It is on murals scattered around the state, office walls, in libraries, and even on coffee mugs. Bob never really anticipated he’d become a painter. The Tenino quarry had closed so he and most his friends worked in lumber or the shipyard – those were the only jobs around. “I didn’t even expect to graduate from high school,” admits Bob. “My brother had quit school to work in the shipyard and I thought that was the way to go. 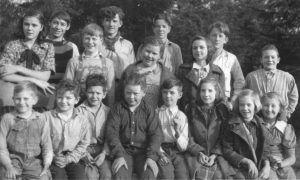 If it wasn’t for Kate Thompson, I probably never would have graduated.” For anyone who went through Tenino High School in the ‘50s and ‘60s, Kate’s name is synonymous with brilliant teaching. Thanks to Kate, Bob did graduate and then went on to join the army deciphering Morse code. Afterward, the G.I. Bill allowed him to study art at Edison Technical College in Seattle. 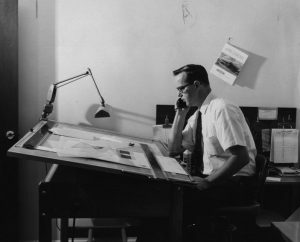 There, Bob began a career in commercial art, landing a job at McCarty Advertising. When he moved into a Seattle apartment building, his upstairs neighbor was his future wife, Maggie. After 10 years, they decided to make the move to Olympia, close to Bob’s family, to raise their family. Here in Olympia, Bob opened his own agency downtown. “I was lucky,” Bob says. 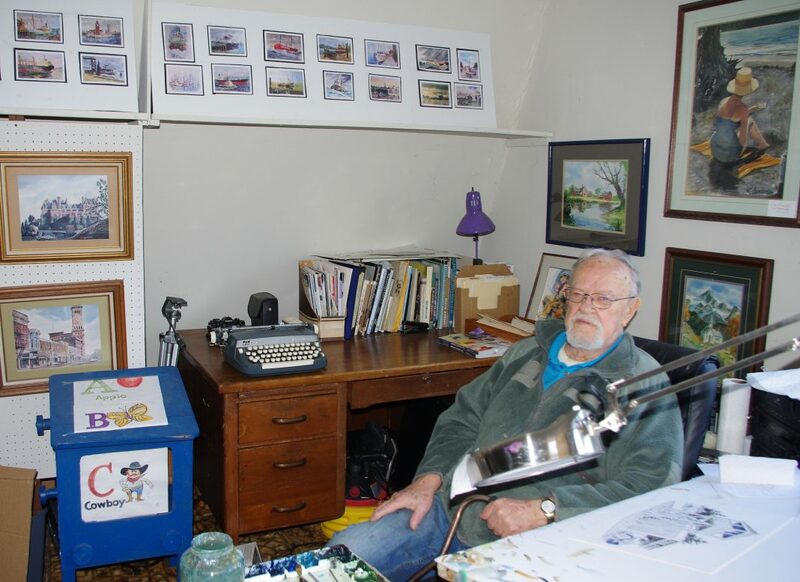 “I was able to get a couple clients right away, several state agencies, the Olympia Brewery and Simpson Lumber.” Little did he know then that water and timber would be two of his most enduring fine art subjects: Timber: A Watercolor History of Logging with 75 paintings and his Maritime Washington series with 30 paintings. “I started working on the Timber series for the Washington Centennial in 1989,” explains Bob, “and the State was interested in it as a permanent exhibit.” Bob pauses. “But then there were huge budget cuts.” The outcome was a collection of amazing art being sold individually to local collectors. “They are scattered all over,” Bob says regretfully. “One lady bought seven, many were sold here and there.” A few have resurfaced in recent years. My mother is now the proud owner of a painting from the Timber series she found in an antique store. It pays to know your local artists. Recently, I was able to attend a presentation of Maritime Washington at the Tumwater Library. The presentation opens with a watercolor of Makah tribe members hunting a whale from a dugout canoe and ends with a super oil tanker breaking through waves. Between is an amazing tour of the life and times of maritime locals and their environment. “I just love to paint water,” explains Bob. “I love the sea.” This series is almost like a tour of the moods of water – ocean storms, reflective calm, deceptive receding tides, all revealed through this artist’s keen eye. Perhaps Bob’s most ambitious work is the series Sylvester’s Window, which he painted between 2000 and 2004. A popular tool for teaching local history, Sylvester’s Window consists of eight paintings depicting Olympia from one vantage point, the third story window of the historic Sylvester home. The series illustrates 160 years of Olympia’s development, from 1841 when known by the Nisqually Tribe as Cheewoot, to the 2001 Procession of the Species parade. 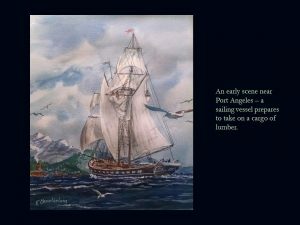 Two years ago, the Port of Olympia purchased rights to 20 of the maritime paintings for use over the next two decades. “That’s a long time,” muses Bob. “They’ll be printing these long after I am gone.” In May of this year, Bob turns 89. Climbing the steep steps to his studio, Wildcat Cove Gallery, takes a little longer these days. Once at the top, the open door reveals large skylights illuminating his art table and new projects in progress. Surrounded by hundreds of paintings and books, he continues to teach and paint. “My eyesight is not as good as it used to be,” Bob confides, “but my colors, they have gotten pretty good.” Ever modest, Bob opens the door to usher me down the stairs. The morning fog has lifted and the tree boughs are reflecting sparkles of light. It’s a beautiful day in Robert Chamberlain’s world of local art.